From Alaska to the tip of Patagonia, read exclusive updates shared by Paul as he embarks on the adventure of a lifetime. Paul's plane – a 1956 Piper Supercub – is built to land and take off almost anywhere he wants. Paul is working 16 hours per day on his plane in order to get everything ready to start his trip on June, 21. When things don't go as planned, all you can do is cope with them and go with the flow. That incredible feeling when after hours and hours of work you finally jump in the plane and just take off. Barrow is a small town in the very north of Alaska, an incredible and special place surrounded by ice. As you travel south, the landscape slowly changes and all these perfectly shaped mountains appear. Flying the plane, paragliding and mountainbiking in Alaska: Paul and his friend Kenny couldn’t be in a better place right now. Still travelling through Alaska, Paul has already seen some of the most fascinating places in the world. Their next stop is Mccarthy in the Wrangell Mountains. Paul had a fantastic first day in Canada! It all started with a free helicopter ride into the sunset. After flights over remote terrain, Paul arrives in Pemberton, British Columbia. Pemberton is a paragliding town and a great spot for Hike & Fly. Paul and his best friend and wife Magdalena are hiking in 40 degrees to find some hot springs... in Hot Springs, Idaho. On their journey to Argentina, Paul stopps at his friend Gavin McClurg's home site in Sun Valley and enjoys one of the best paragliding days of the year. The next stop is Telluride, Colorado, where after landing at 9,070 FT they meet up with a friend from Austria. Kevin, who Paul met in Montrose, invites him over to his place in Moab to do the maintenance on his Supercub. THE BIGGEST TRUCK IN THE WORLD? After few adventures Paul, his wife and the Supercub finally arrive in Santa Paula, where a special truck is waiting for them. Finally Paul has arrived to Santa Monica and then San Diego, in California. 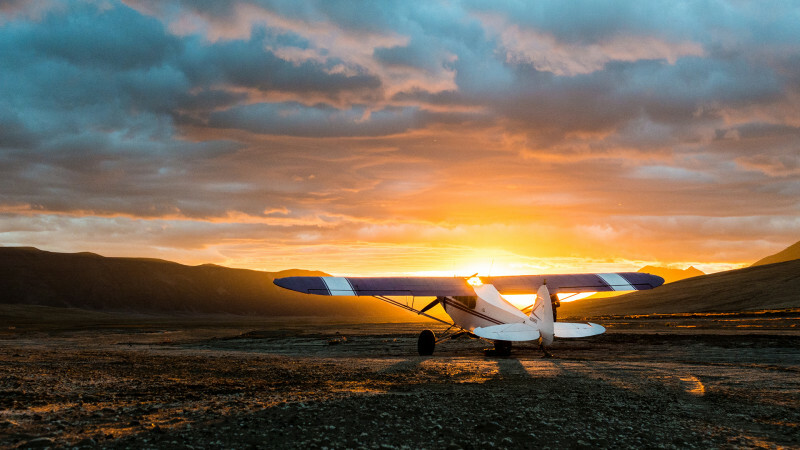 He always dreamed about landing in Santa Monica and San Diego with his Alaskan Supercub! The dream came true.... Now, next stop Mexico! The last American take off and the first Mexican landing for the Supercub.